In the Members' Lounge in the afternoon to eat, watch the news, read newspapers, and throw parties at night. The restaurant boast Shiso Asian rarities. In The Library resting. In the Crystal Bar drink and listen to Dj. Entrance to the Prague club - only for obtaining membership card, the application for which you can download on the site. Prague’s first members‘ only club, LS Club is the embodiment of luxury and class. 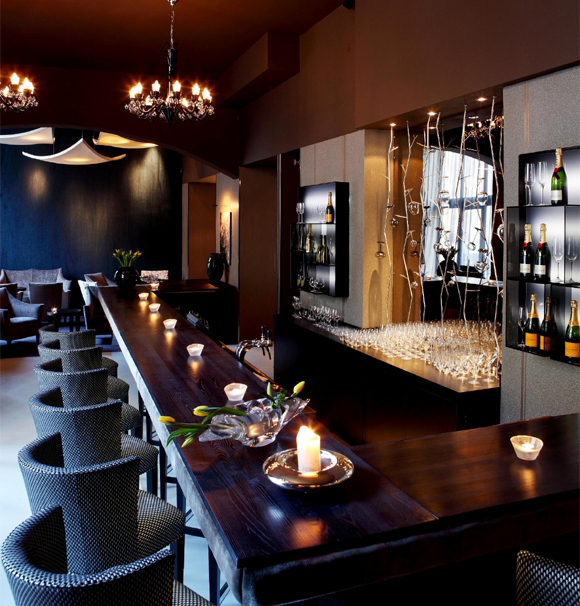 Located off a cobblestone lane in the middle of picturesque Old Town, LS Club is the new select design location for Prague’s business and entertainment elite to relax, dine and talk business if they wish. LS Club is to be more than a club; it wishes to be a space, a lifestyle, a privilege. The LS Club consists of several different rooms including the Members’ Lounge, the Crystal Bar, the Library, and Restaurant Shiso. Upon arrival the uniformed valet parks your vehicle, the doorman respectfully greets you and the floor manager then shows you to the Members’ Lounge, which is complete with designer leather armchairs by John Hutton, designer chandeliers by Rony Plesl, plasma screens showing worldwide news, and dark suede walls decorated with a photography exhibit by Rossano Maniscalchi. While you relax in the Members’ Lounge you can sip on cocktails made especially and expertly for LS Club served in designer glassware. Members can then treat themselves to the eclectic Asian cuisine created by top chefs and served in the stylish Restaurant Shiso, where the calm soothing Asian inspired interior invites lively conversation (Restaurant Shiso is open to the public but requires a reservation). After dining one may find him or herself in the warm library offered at LS Club, which features leather bound classics, comfortable leather armchairs, aged whiskeys and a humidor filled with top cigars. After a stimulating conversation and a rich whiskey one can then make their way to the Crystal Bar, named so for the multitude of crystals hanging from the ceiling, where one can relax to ambient beats from international DJs bouncing softly off the dark velvet walls. The Crystal Bar is furnished with plush comfortable seating and offers only the best-imported whiskeys, vodkas and gins, as well as vintage champagnes. The LS Club also employs a receptionist offering 24-hour concierge service. Membership is limited to select clientele, new members will be personally invited to join or will require an endorsement from a member of the LS Club. The application form can be downloaded from their website. Nowhere in Prague can one find such decadence, sophistication and style.